Injustice 2 Introduces The Atom | Nerd Much? The Atom can get inside the head of his enemy, literally. Warner Bros. and DC Entertainment has announced that The Atom will be joining the roster of Injustice 2. He comes with Fighter Pack #3, or is included when you purchase the Injustice 2 Ultimate Edition and the Injustice 2 Ultimate Pack. The Atom will be available come December 12, 2017 on the PS4 and Xbox One. This version of The Atom is the Ryan Choi version, a prodigal of Ray Palmer, the Atom before him. If you don’t already know, it was only when Palmer went missing that Choi took up the mantel of The Atom worked hard to keep Ivy Town safe. In the trailer we see a variety of moves from The Atom, like his ability to change his size from very small to very big. His dodge also allows him to slip past his opponent and hit them from behind. 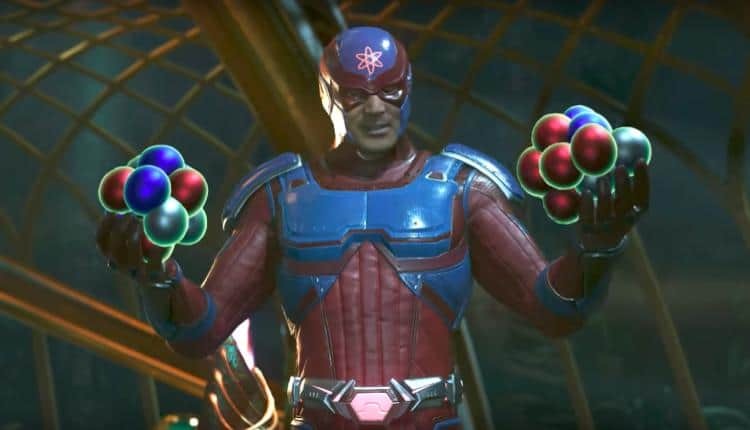 The Atom even uses one of the globes in the background and throws it at Black Mantis. The Atom also wields a stun gun that locks enemies mid-air, Choi then takes the opportunity to drop some kind of chemical, which ignites when he adds another chemical. This explosion sends his enemy into the air, giving The Atom another opportunity to attack. We also see The Atom become a shiny blue dot that manages to beat his enemies quite easily, getting plenty of hits in. He uses this move to get inside the head of his enemy, literally. Scramble a few things between the ears before he enemy swats him out like he has water in his ears. On the opposite end, The Atom can also get very big and uses his giant size to defeat his opponent once and for all.